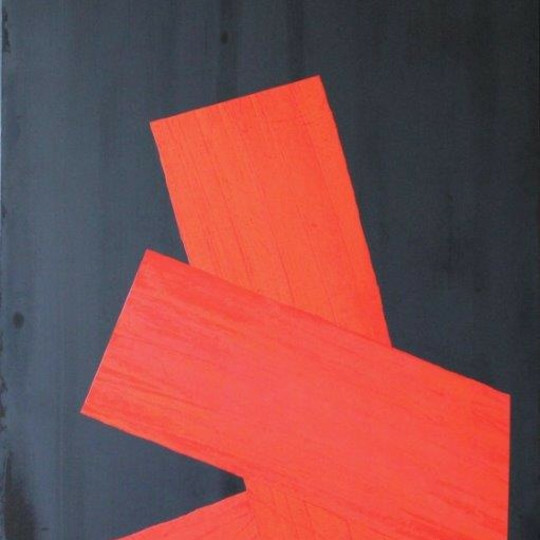 Rikizo Fukao, whose works hang in the British Museum's permanent collection, is best known for his striking, textured compositions of red on black. His minimal colour palette is inspired by Buddhist concepts of duality and balance. The bold slashes of red paint imply passion, and the matte black beneath contrasts that with stillness. In many ways Rikizo bridges western and Japanese cultures. His motifs are drawn from his Japanese upbringing, but they are painted on canvas with a clear awareness of western abstraction and minimalism. He often works on the scale of the tatami mats that line the floors of Japanese homes, and Lawrence Smith, former Keeper of Japanese Antiquities at the British Museum, has noted the paintings' resemblance to traditional calligraphy. Rikizo's paintings 'give the impression of being an exploration of a written character perceived as if in a dream', he writes. Despite not coming to painting until he was 24 - when he moved from Japan to Switzerland, and only giving up his job as Chief Programmer at the International Labour Organization to paint full-time in 1981, Rikizo has become one of Japan's most admired contemporary artists. Rikizo Fukao had his first solo exhibition at the Annecy Museum in 1975. Since then his works have been exhibited widely throughout Europe. In 1999 Rikizo had his first solo exhibition in Japan. In 2009 Rikizo had an exhibition in Kyoto's historic Kodaji Temple, marking a historic moment for the Temple - it was the first time that textured works on canvas, rather than the traditional, two-dimensional paintings on silk or paper, had been shown at the temple.